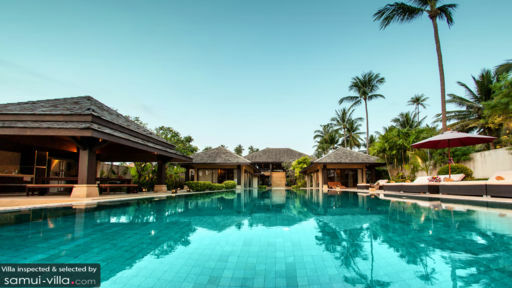 With direct access to Thong Krut beach in Samui, Thailand, Ama Lur Villa offers a peaceful and tranquil private location to travelers where they can spend their time frolicking in the water, the golden sands, or the soothing ambiance of the villa itself. 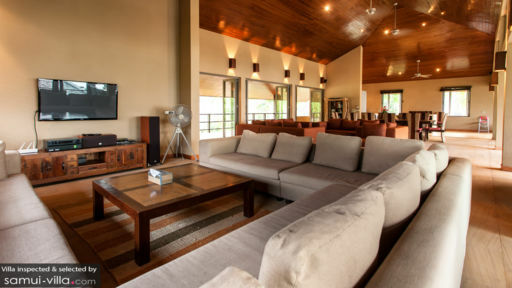 The five-bedroom retreat can be rented out as a three-bedroom villa as well, depending on your requirements. For a fun-packed vacation, enjoy with friends and family as you relax amidst natural surroundings and ease your worries. Ama Lur Villa boasts of five super spacious bedroom suites furnished with king-sized beds and with glass sliding doors that lead to the gardens. The luscious greenery outdoors compliments the neutral ambiance indoors for a wholesome experience. There are comfortable armchairs in the bedrooms where guests can lounge and watch some television as well. The layout is such that it provides you with ample room to do whatever it is that you wish. Each of the five bedrooms is air-conditioned and has an en-suite bathroom that is equally luxurious. There are freestanding bathtubs in the bathrooms, views of the outdoors, and dual sinks for comfort! A stunning 18-metre swimming pool, bordered by a pebbled quarry and overlooking the gorgeous panorama of the skies and the ocean greets you as you step outdoors at Ama Lur Villa. Beside the pool, a patch of grass looks out to the water and there are daybeds where guests can lounge with a drink or a book relishing the privacy. 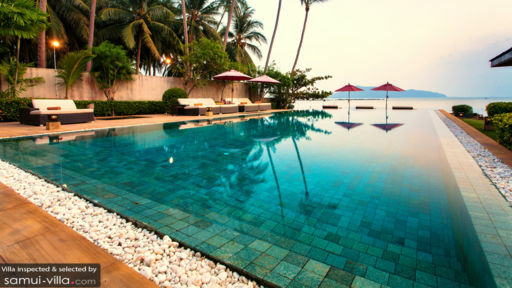 There are lounging beds on the pool deck as well, so you can stretch comfortably after a dip or a splash in the pool. With parasols keeping you under the shade, you could even indulge in an afternoon nap! The cherry on top is the greenery that engulfs the villa’s exteriors, shrouding it in a delightful hue that will instantly put your mind at ease. As you ascend the steps from the swimming pool, you will reach the sprawling living and dining area at Ama Lur Villa with its traditional interiors and modern décor. There is a high-soaring rooftop adding ample space to the area, and the open-plan design even allows for natural sunlight and the fresh air to flood the room. Hardwood flooring creates a cozy ambiance and the comfy sofas are placed strategically facing the remarkable view that you get to enjoy endlessly. Minimally decorated with Thai accents, the living area is a great place for everyone to hang around and spend quality time with one another. Apart from seating, there is a dining area as well furnished with a 10-seater dining table, and you will even find an alfresco dining area for a truly enchanting experience. The open kitchen is fully-equipped to serve guests with western appliances and amenities fitted in sleek style. There is an island countertop with barstools to make for a nice for guests to mingle. One corner of the living area is dedicated to entertainment with plush couches, a massive flat-screen TV and surround sound! The friendly and kind staff at Ama Lur Villa is there to assist you in settling in and to ensure that your requirements are met. As you will be served a delectable breakfast each morning, you can be rest assured that your day will start out in the best possible way! The staff can help you arrange for excursions and trips into town, recommending where to go and what to see as well! Thong Krut Fisherman’s village is a laidback and quiet area with shallow waters ideal for swimming and sailing! Enjoy an easygoing tropical adventure with loved ones as you explore the land. There are many restaurants in the vicinity as well such as La Paillote, great for French food!